My office has been a mess for a while — too long. Monday night I decided to make a dent in it. Rachel and Jeremiah both put up Christmas lights recently, so I was inspired to put up more lights in my office and get that one strand working again. 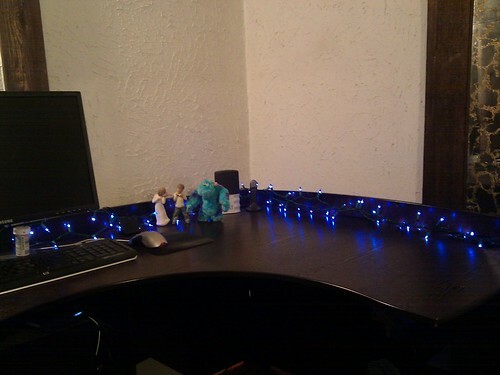 The result: a clean desk, now with lights! I'll have more photos as I continue to clean my office and put up more lights. OMG double blog posts today! What does it mean?! 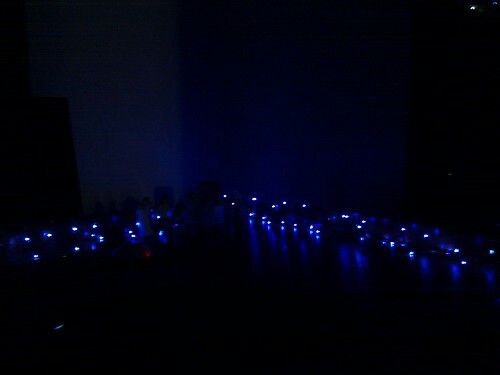 aLSO, i LOVE BLUE LIGHTS, PRETTY SWEET. DAMN CAPS LOCK. ARGH. GrEGOR! 12-3 IS THE HARDEST PROBLEM I'VE SEEN YET ON HERE. GOSH. Haha. Yeah, each of those have important sentimental value to me.